Manchester United twice had to come from behind to earn a point with a 2-2 draw against an inform Arsenal side in a performance that Jose Mourinho described as showing “big heart and soul”. After a run of recent poor performances that see’s the once title contenders eightieth in the league and gasping to stay with the top teams, Mourinho made the bold decision to drop two of his high profile players, French world cup winner Paul Pogba and Belgium striker Romelu Lukaku to the bench. With it being so often the case this season, United went behind midway through the first half, not to some excellent play from the opposition but this time from an uncharacteristic error from Spanish keeper David de Gea, who some how failed to stop a somewhat limp header from Shkodran Mustafi as it bobbled over the line. To United’s credit this seemed to give them the kick they needed, and they were level within minutes as Anthony Martial was quickest to react when Gunners Keeper Bernd Leno failed to deal with a United set piece to make it 1-1 at the break and set the game up for a big second half. Both teams had chances within the opening minutes of the second half, but it took until the 68th minute before Arsenal retook the lead thanks to substitute Alexandre Lacazette who is in the right place to scramble the ball past de Gea after some miscommunication in the united defence. 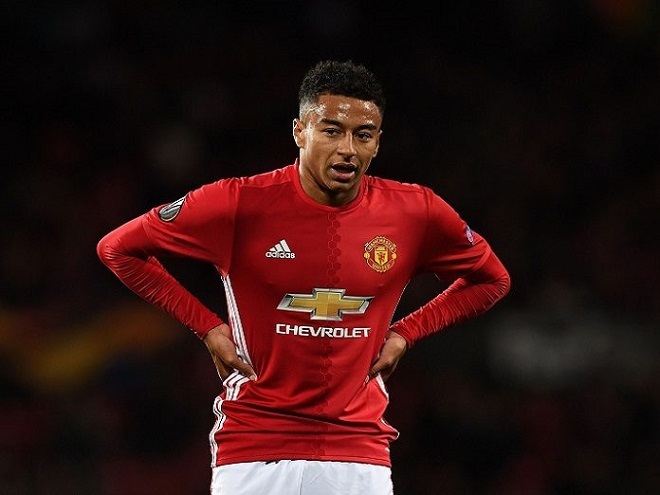 However, this seemed to wake the sleeping giant up again and with the help for some sloppy passing within the Gunners defence, England’s Jesse Lingard ( pictured) pounced on Sead Kolasinac’s attempted back pass to score his first for the season in United’s colours. As the game entered it closing stages it was the visitors who looked the hungrier side for the three points as Unai Emery’s men where only denied the victory thanks to some excellent goal keeping from De Gea, who more than made up for his earlier first half mishap to help his side earn a vital point. The result see’s United settled in eight spot, eight points off fourth placed Chelsea and a massive 18 behind premier league leaders and cross city rivals Manchester City. They are currently level on points with Everton and Bournemouth, but as the only team in the top 9 that has a minus goal difference a hectic Christmas period could see them drop even further behind. For the Gunners they missed the opportunity to move above Chelsea into fourth place, instead having to settle for fifth on goal difference, but have opened an eight point gap between themselves and the rest of the chasing pack.